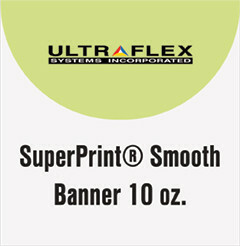 SuperPrint® Smooth Banner FL is a 10 oz. front-lit banner material. Designed specifically for interior, close viewing graphics. Has a smooth face creating a uniform print surface ideal for creating eye-catching graphics. Matte finish and is compatible for use with solvent, eco-solvent, UV and screen printing.